Hanaa, you are back in Beirut after your participation in «Mission Fashion» in 2009… How does it feel to be back? I am very excited and happy to be finally back. The city prospered in the past eight years. There are many more modern buildings, fashion stores whether designer names or concept stores. This time, you’re here for «Fashion Star Arabia», a new program on Dubai One TV, but as mentor… Can you tell us more about this show? The show’s concept is all about fashion. 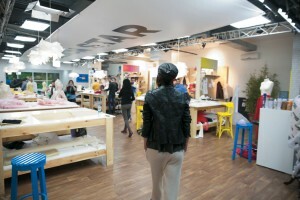 There are 12 designers from different parts of the Arab world representing their countries. The designers are divided into two groups all competing every week and each group has a mentor; myself and Ramzi Tabiat. Overlooking the mentors and designers is the principle mentor and sponsor of the show, designer Reeem Acra. Each week they are presented with a theme for Spring-Summer 2016 and each designer needs to create his designs around the theme and the season. Ramzi and I try to guide them to improve their concept, during the two days they have to design their creations and Reem Acra supervises all the designer’s work. Finally, they present their themed collection on the catwalk and they will be judged and eliminated one by one every week until the last one becomes the Fashion Star Arabia. Before being a mentor, you were in the shoes of the participants (as model)… Does this give you a different perspective than your colleagues? Do you go easier on them? On the contrary, since I have a very different perspective, I am most probably more acute to details concerning cut, materials, colors, and how well it fits on the model and how attractive it is in the eyes of the beholder. I have done runways and wore the most beautiful creations from the world’s best fashion designers: Gaultier, Givenchy, Hermès, Dior, Vauthier, Ralph & Russo, Chanel, etc and I tried my best to share my experience with the designers to help them improve, create and draw their attention to specific details. What makes a successful collection in your opinion? In my opinion, a successful designer creates a unique collection true to his or her identity. It is the difference between a copied and already seen design or creating a different design reflecting the identity of the designer. In parallel to uniqueness and identity, is designing clothes which add value to the silhouette. It is very important that design looks its best when worn and I am constantly keeping an eye on this overall detail. How would you describe Hanaa’s typical day? I usually wake up fairly early and begin my day by drinking a fresh pressed vegetable-fruit juice. If I don’t have an early work day, I do a workout with my coach. I then shower and change, go through my emails and head out either to a work appointment or other. You are the first Arab model to get international recognition. You walked for the biggest names in fashion, was the face of Lancôme, struck a pose for renowned fashion photographers… All this while staying true to yourself and your beliefs… How hard was it to break through? Does the fact of being from an arab country put extra pressure on your shoulders? It was difficult in the beginning but when designers, photographers and others in the fashion industry began to understand and see I am professional in keeping my values and origins, a mutual understanding and respect was established. What made you want to become a model? What attracted you to this world? I always loved Art and Fashion. When I was young I always watched fashion shows of Jean Paul Gaultier on TV and saw that I had the same tall and slim silhouette as the models. It became a dream to walk the runways with all the glamour like those models I saw on TV. How hard was it, or still is, to explain to your family what you do and make them accept it? When I first began my modeling career, I couldn’t explain the fashion industry because I didn’t understand it completely. Through experience, trials and errors, I learned. Today I feel knowledgeable and experienced enough to explain it to anyone and everyone. I am very blessed to have a family very proud of what I have accomplished. In our region, anyone who walks a catwalk or is in an editorial shoot, is quickly labeled a Top Model or a Super model, while in fact, a model is not necessarily a top Model, and there are several categories of models… Can you explain the differences and the different categories? I would love to explain it because there is misconception in the region of what makes a model truly a Top model. In the Arab region, any model who presented a show with a foreign designer, they automatically tag her/him as a Top Model. When in fact the word «Top» needs to have weight and influence in the International fashion industry. There are two categories of models in the International fashion industry: The Commercial models on one hand and the Fashion/Editorial models (Top Models) on the other. The commercial models are the ones you see on TV and magazines that carry commercial brands and names. A commercial model’s career is not very long lived unfortunately. The Editorial/Fashion model begins a career as a new face, then starts presenting shows for brand name designers like Chanel, Dior, Hermès, Valli, Gaultier, etc. She is featured in editorial photoshoots in high end fashion magazines and works with the most renowned photographers; Vogue, W, V magazine, Intermission, Antidote etc. She begins to build an image and a name within the international fashion industry, moves on to become a top model. As her career continues, she eventually becomes an icon. A simple example is Claudia Schiffer or Naomi Campbell. We hear a lot about the «dark side» of the fashion industry (pressures, jealousy, partying, etc)… What’s your take on that? It is not all true. When you are represented and work with renowned agencies in the fashion industry, they are very professional and serious. It is the choices one makes. In every industry there are good things and bad ones. It all depends on whom you chose to work with and how you work in achieving your goals and aspirations. What advice would you give to an aspiring model, from our region, that you wished was given to you when you started? I was lucky and the right people came into my life at the right time. However, the best advice I would give is for them to choose a reputable agency to represent them. If you had to choose four key dates of your career, which ones and why? 2009 when I met my manager Sophie Galal. 2011 when I did the Givenchy exclusivity fashion show. 2012 when I signed the Lancôme worldwide contract. 2013 because of all the amazing editorials and photographers I started working with. What is your main flaw? Perfectionist. Your idea of happiness? Doing what I love. Your definition of elegance? Simplicity. How would you describe your style? Minimalistic chic. Your favorite dish? Couscous of course! Your hero/heroine in real life? My mother, Leila. Your motto in life? Be true to yourself.